Available in PCSchool version 2014.03.03 and above. PCSchool has now added the ability for schools to include additional text / instructions at the top of the Parent Payment Portal view. This option allows schools to include instructions to parents on how to use the payment portal and when the payment is expected to be processed and applied to their outstanding fees. 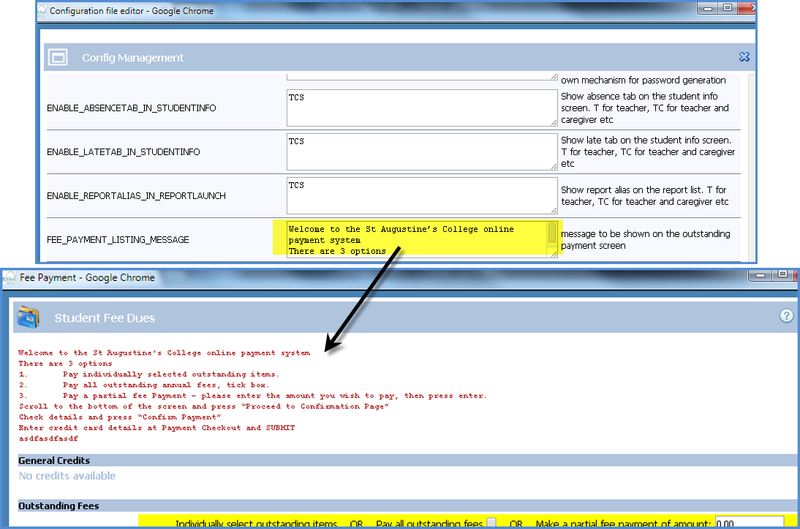 Option to add text to Payment Portal is found in the Administration control – Update Configuration File in the Spider. This entry was posted in Debtors, Payment Portal, Spider and tagged Classroom Management, Payment Portal, pcschool, school administration software, School Administration System, School Management Software, School Management System, school software, spider configuration, Student Information System, student management Software, Student Management System, web config file, web spider by studentmanagementsoftware. Bookmark the permalink.